... and - to complete a trilogy - here’s my (Dummy’s) guide for Ruby with ONTAP! 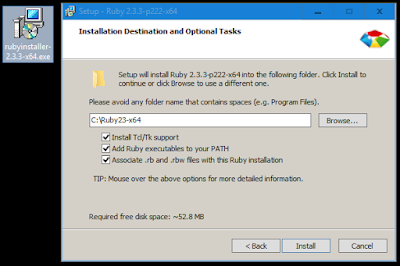 Double-click the rubyinstaller exe file, and follow the prompts to install. The Ruby 2.3 64-bit default install directory is C:\Ruby23-x64. If it’s your only version of Ruby, tick the ‘Add Ruby executables to your PATH’ - in fact, tick everything, why not! Below is a very simple Ruby script example taken from the NMSDK and ZExplore.